Dave at the Thelma and Louise point overlook, with the Colorado River in the background. Thanks to a passer-by for taking the photo. 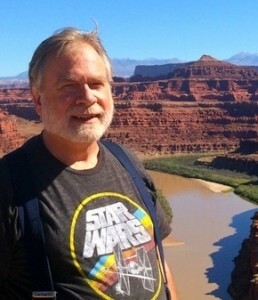 The shirt shows that I’m looking forward to a certain soon-to-be-released movie! Photo taken from 38° 27′ 6.55″ N,109° 44′ 4.41″ W.
For day 1, I chose the Potash Road trail. In this case, I’d agree with the author’s rating of easy: it was straightforward. From Moab go north, turn left on Potash Road (well-marked), and travel generally south. The road curves along the west/north side of the Colorado River and has its own beauties, so stop to take pictures. The pavement ends at the Potash plant. You drive a bit to the left around this. Just beyond the plant there’s a parking/staging area. The gravel/dirt road heads up from there. You’ll find the going easy. I’ve attached the GPS track and a GPS map at the bottom of the post. You’ll travel past an industrial operation that extracts salt from brine. The evaporation ponds are enormous! As you approach them, you’ll come to a large balancing boulder right next to the road as shown in the photo. That rock is balancing on that tiny little spot. 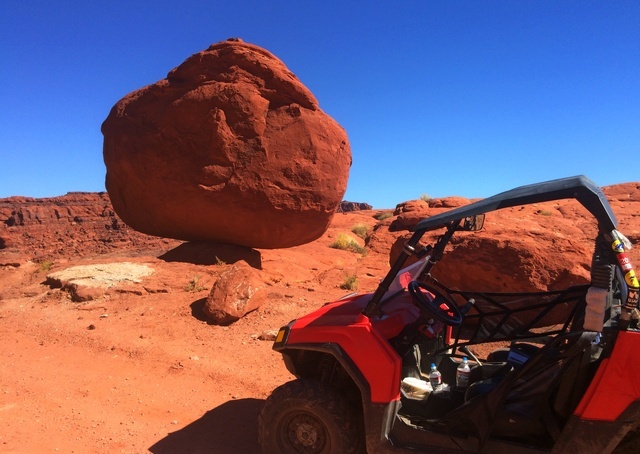 The rock is bigger than the Polaris RZR. I know that it likely won’t roll away for a century or two, but I stayed well away from it! Photo taken from 38° 29′ 47.63″ N, 109° 40′ 40.91″ W.
It seems to take forever to get around the evaporation ponds, but it finally happens and you come first to Thelma and Louise point, so-named because that’s where the car launches into the Colorado River in the Thelma and Louise movie (which I’ve never seen). The view is quite grand as shown below. The view from the Thelma and Louise overlook. Photo taken from 38° 27′ 7.17″ N, 109° 44′ 3.89″ W.
Next, I motored on to the viewpoint for the Goose Neck. 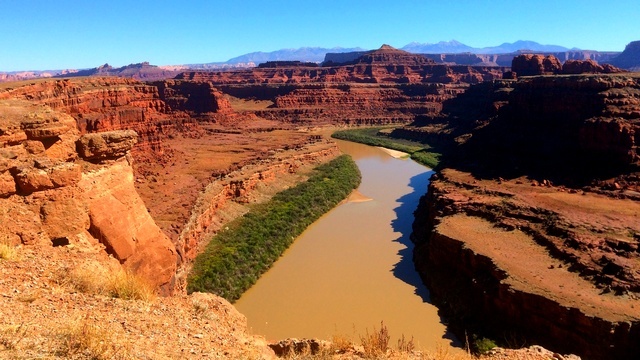 This is a spot where the Colorado River turns back on itself, as shown in the photo below. That’s the Goose Neck in the middle. The picture is a wide panorama and catches the river both coming (from the left) and going (to the right). Photo taken from 38° 27′ 36.61″ N, 109° 45′ 35.87″ W.
This photo shows the cliffs rising from the river, taken from the same viewpoint as the last photo. 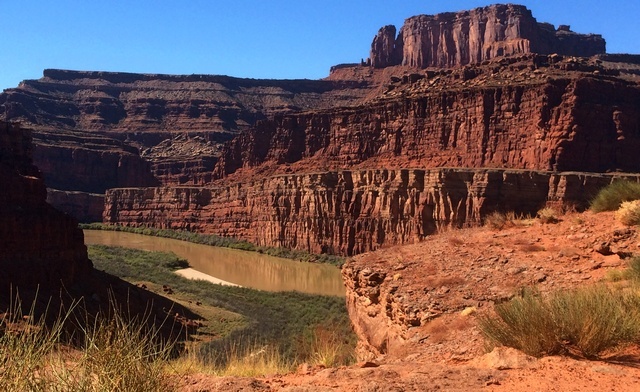 Cliffs rise from the Colorado River. Photo taken from 38° 27′ 38.22″ N, 109° 45′ 16.01″ W.
The road continues up the side of the hill to Canyonlands National Park, however ATVs aren’t welcome there, so I went up a bit further and then turned back around. 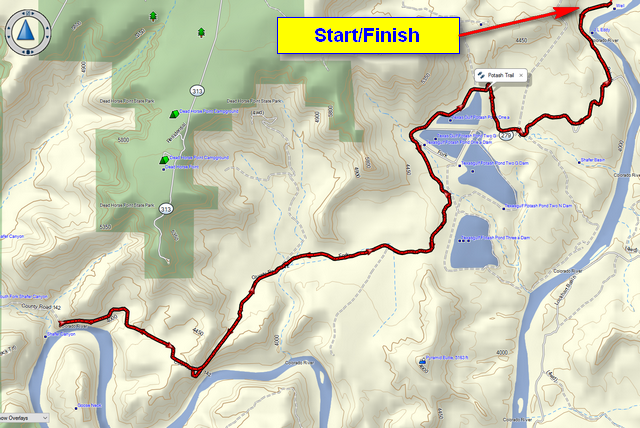 The image below shows the GPS track, and below that is the GPX file if you are interested. The usual caveats apply. The GPS is a Garmin GPSMap64st. This was my very first trip with it, so hopefully none of the button pushing messed up the track. Potash Trail. It starts just south of the potash plant at a parking lot that can conveniently be used as a staging area. To get the GPS track, click on this link and download it. As a GPX file it might import easily into your GPS software; it works fine with my older DeLorme Topo North America (v10). The GPX file references some photos—they’re the same photos as shown above. I also uploaded this as a Garmin Adventure. Note that the GPS coordinates given in the photo captions are from the iPhone 5S, not from the Garmin GPS. The format is DD° MM’ S.SS”. This entry was posted in All-Terrain Vehicles (ATV) and Side-by-Side, Utah and tagged Moab, Potash Road. Bookmark the permalink.